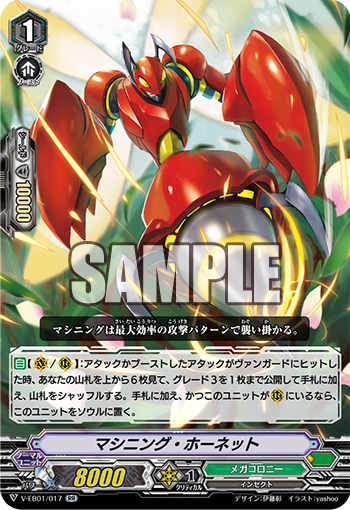 The Japanese Card of the Day for June 11th, 2018, is a Megacolony Double Rare from V-Extra Booster 01: The Destructive Roar, Machining Hornet. 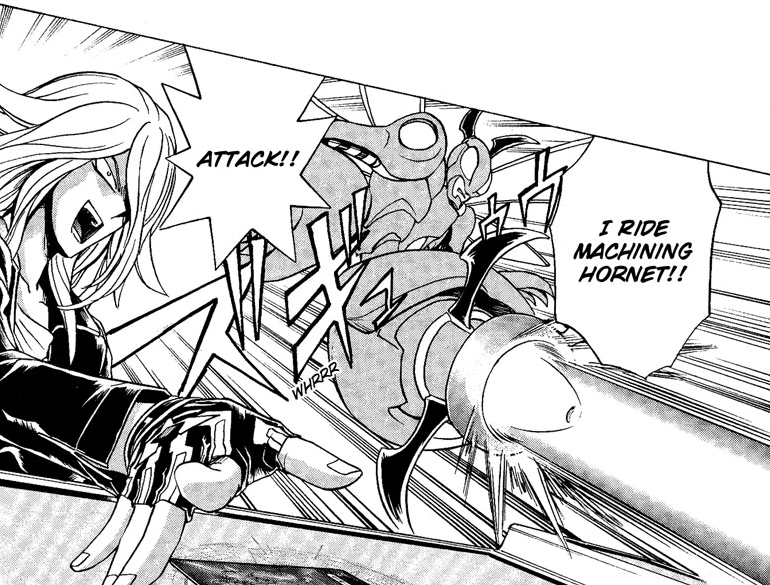 Machining Hornet is the grade 1 counterpart to Machining Mantis, but rather than costing counterblast is attached to an on-hit condition. On vanguard circle Hornet is a straight +1 in a card advantage, while on rearguard circle it's a net-neutral exchange akin to Wingal Youth in the previous format--you gain a card by giving up a card. Similar to Circle Magus over in Oracle Think Tank, Hornet is an ideal opening ride that continues to serve a purpose in the rearguard as the fight progresses. And also like Oracle Think Tank, Megacolony is a Protect clan that adds its Gift to hand, stretching that +1 into a +2 once you actually ride the grade 3 you revealed. While rearguard Hornets are neutral exchanges, like Mantis the potential for Machining boss cards to retain their signature call-from-soul mechanic carries alluring possibilities. You could trade Hornet to add Stag Beetle to hand, then ride Stag Beetle next turn to bring Hornet back out to seek your ride for the turn after that. Since Hornet only goes into the soul if you actually find the grade 3, there's no reason to not use the skill at each and every opportunity. Machining Hornet's introduction in chapter 5 of the Cardfight!! Vanguard manga, used by Kawanami Minami. The previous Japanese Cards of the Day were Archbird, Cheer Girl Marilyn, and Paralyze Madonna.